You may remember I reviewed Avokiddo Emotions last year. I commented that the art work was attractive, and the app itself lots of fun. So I was pleased to find the Beck and Bo app for iPad by Avokiddo. What I liked: This app seems well-suited to younger children. It’s gentle and intuitive, encouraging kids to create little animated scenes from elements that slowly drop from the sky. Items are named so children can perhaps learn new vocabulary. There are no ads or in-app purchases. I like the emphasis on safety - Beck and Bo are unable to move when traffic lights are red, and one child must move out of the way before the other comes down the slide (okay, I admit it, I tried it to see what would happen!) There’s a link for parents to go to check out other apps, but unless kids work out to hold a finger on it for three seconds, they won’t stray there. The art work is attractive in this app too, similar to that of my favourite illustrators in good children’s picture books. I like the emphasis on children creating scenes and interacting with them. Parents could add value to the app by discussing what’s going on in each of the twelve scenes. Make it a game by asking kids to follow your directions when they build a scene, or by creating a scene, then changing one element while kids aren’t looking. 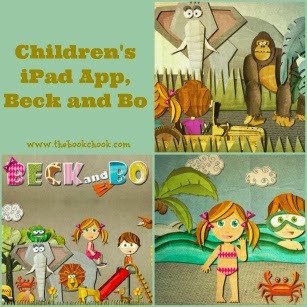 In conjunction with this review, Avokiddo are offering redeemable codes for iPad app Beck and Bo to six readers of The Book Chook. If you’re interested in getting a free version of Beck and Bo for your children/students, send an email with "Beck and Bo Giveaway" in the subject line to thebookchook(at)gmail(dot)com within the next three days. A random and possibly sleepy chicken will choose six lucky readers at 5.00am on June 5, eastern Australian time, and I will notify them soon after.